Since the law on safety in 2005, it is now mandatory to install an approved security system on swimming pools. 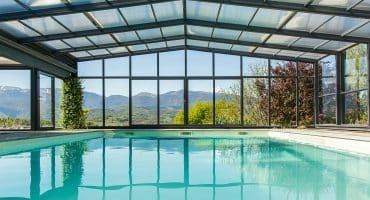 Among the 4 existing methods, a pool enclosure appears to be the most effective solution when compared to alarms, barriers, covers and shutters. Discover the numerous advantages of enclosures in our practical guide below. 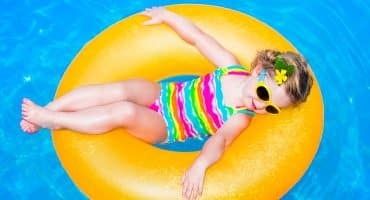 In order to keep people and especially children safe, a pool must be inaccessible when not being used. From ultra-low to high level, Vénus enclosures guarantee optimal levels of safety that are compliant with the French standard NF P90-309 on pool enclosures. An enclosure eliminates the risk of accidental falls and trespassing with its key lock system. 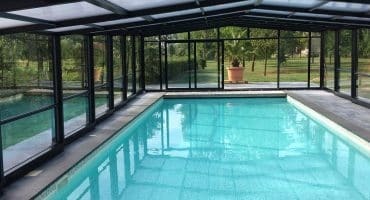 Unlike other methods, a closed enclosure effectively prevents any contact with the pool water..
A pool enclosure stretches over your pool and traps the heat generated by the sun, therefore producing a greenhouse effect and increasing the water temperature. Depending on where your pool is located and the local climate, the water temperature can be increased by 6 to 12°C. It therefore becomes possible to use your pool more often, sometimes all year round with a high-level enclosure. An enclosure prevents contamination and keeps out dirt and debris, keeping the water clean all year round. As a result, you spend much less time and money cleaning your pool. You can choose to leave the filtering system of your pool on over winter by adjusting the filtering times to the temperature. This method is the simplest solution as it requires a lot less preparation than stopping all filtering and treatment.